We had a lot of people in for Thanksgiving this year. It was our first Thanksgiving in the new house, and I think Jodi kinda wanted to show it off a bit. I guess technically, it was the second, but last year, we had only been in the house about a week. No time to set up for a party. My sister and bro-in-law came out and I spent a good time talking with them. They are both excellent cooks, and gave me some good advice. One of the problems I have with biscuits and soda bread is that it doesn’t rise like I want it to. She said that non-yeast leavening should be put into a hot oven. I usually just put things into the oven and then put them on the coals. I didn’t realize it would make a difference. They also had some good advice about the balance of wet and dry in breads. You know, there are so many ways to do a turkey, and so many recipes it’s just amazing. I’ve been reading over on the dutch oven yahoogroup about all the ideas and methods and recipes, and it’s just amazing. While I’m giving thanks, I’ll give all my friends over there some good thanks for all their advice and help this last year. I did the same herbal roast turkey that I did for Christmas last year, from Byron’s. I did it pretty much straight as he lists it. Still, I’ll include the recipe here. We also did one of that in the regular oven, because I could only fit a 13 lb turkey in my 14” Dutch oven. Then, in the 12” deep dutch oven, I did ham recipe of my own design. I’ll write the recipes up separate, even though I roasted them concurrently. OK, I started out with the turkey, and began by mixing the stuffing ingredients and removing the neck and giblets, and various pouches that the company sticks in the turkey. I’d kept it in the fridge to thaw for the last few days, and took it out early in the morning. I wanted to have it on the coals by 10, to get it on the table by 2:30 or 3:00, including carving time. A 13 lb turkey isn’t going to have very much room for stuffing so I didn’t really do that much. But I stuffed it in the body cavity and set the turkey in the 14” dutch oven. Then I rubbed the additional minced garlic onto the body and sprinkled some salt over it. Then, I added a cup of water to the dutch oven, for steaming, and closed it up. I put that on the coals. In the 8” dutch oven, I combined all of the basting sauce ingredients, and simply set that on top of the turkey dutch oven lid, using those upper coals to melt the butter and simmer the sauce. From then on, it was simply a matter of keeping the coals fresh and basting the turkey occasionally. The total cooking time was about 4 hours. About an hour to an hour and a half from serving time, I sliced up the potatoes and the carrots and just dumped them in around the bird. I didn’t bother with mashing the potatoes, I just served them alongside. Someone else in the family brought the mashed potatoes, anyway. 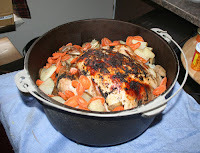 Some folks I’d been talking to mentioned that a dutch oven turkey doesn’t brown up like an oven-baked turkey. While that’s true, I found that this one did brown up quite nicely on top. I imagine that’s because of it’s proximity to the lid with coals on. I did try and keep the coals toward the edges rather than in the middle of the lid, so it wouldn’t burn. I started by putting the ham in the dutch oven. I actually had to cut it up into chunks to make it fit, and one chunk is still in the fridge. This would have been better in my 14”, but that was being used by the turkey. I also sliced diagonals back and forth across the surface of the ham, to let the seasonings seep in. I mixed all the other ingredients in a bowl, and then just smoothed that over the surface of the ham. Then, I put that on the coals. There was a lot of liquid in the ham, so as I baked it, from time to time, I’d open up the dutch oven, scoop up the liquid, and baste it over the meat. I cooked the ham just as long as the turkey. Keeping the heat on was tricky. I went through a LOT of coals. You have to watch the under coals, because it’s easy to pay attention to when the coals on top are burning down, but the ones on the bottom need to be replaced, too. Well, this was a long one, but I hope it helps you! Your turkey looks great! I'm researching how exactly to plan to do our Thanskgiving dinner at our unfinished cabin on Kodiak island here in Alaska with Dutch Ovens, and this is a super helpful post! Great recipe!